9806 - Non-Sloped with Ductile Iron Rail Trench Drain System - Jay R. Smith MFG Co.
Used in all surface drainage applications. 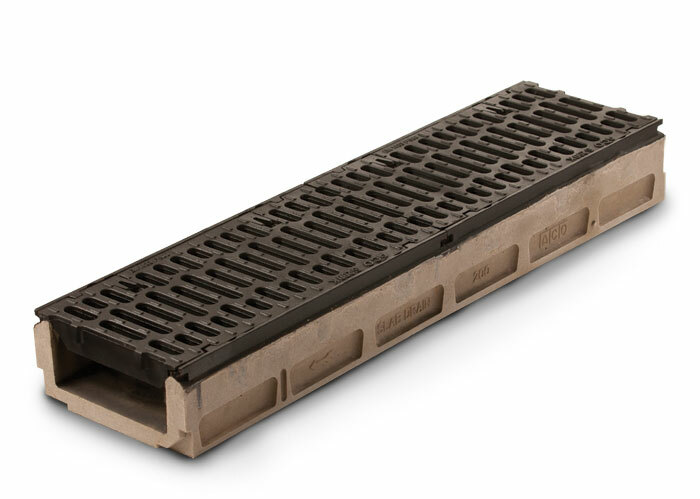 Shallow non-sloping channels may be assembled in any length utilizing integral ductile iron rails that allow for extra heavy duty hard wheel traffic applications. 1 meter (3.28') Precast Polyester Concrete Channel of Interlocking Design with No Slope. Channel Has An Integral Ductile Iron Edge Rail and 8" Internal Width. Supplied with Secured Ductile Iron Grates.